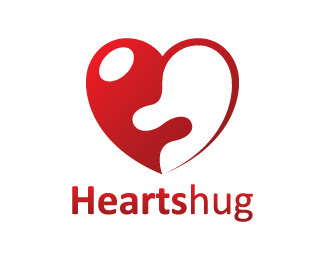 Hearts hug a logo that can be used for a love and dating site, a wedding service or anything matching two people to fall in love. The logo represents two persons hugging each other and forming together a heart, also its a kind of yin yang , two parts that can't be one with out the other. It's a great logo and can easily stand alone with out showing the name. This logo is currently up for sale here and you can contact me if you are interested. This logo is a concept so it can still be altered in name or design.